How to Play Blu-ray on iPad directly? As the winner of the war for the successor of DVD, Blu-ray can provide extremely HD video effect. With higher compression ratio and advanced HD encoding technology, Blu-ray is more and more popular among the modern society. You can now play a Blu-ray on your computer with a Blu-Ray Disc™ drive and a Blu-ray player, but how to play a Blu-ray on your iPad, iPhone, iTouch? iPad, as the leader of tablet computers, got lots of fans around the world. Supporting up to 1080p video, you can enjoy your HD movies on iPad comfortably. But it is a pity that you can’t enjoy your Blu-ray movies on iPad because of no Blu-Ray Disc™ drive with your device. With the release of Mac Blu-ray player which can first play Blu-ray on both Mac and windows, this problem be solved. The version 2.0 is built-in with an “AirX” option, with which users can enjoy their Blu-ray on an iPad conveniently. How to play Blu-ray on iPad on the Go without Changing Free Space? Step 1 First free download Mac Blu-ray Player, install and run it on your computer. Both Mac and windows version are available here, make sure you choose the appropriate one. Step 2 Before inserting Blu-Ray Disc™ or playing local movies, you should first enable the “AirX” option under the “Tools” menu. Note: The tool can play any Blu-ray, including all possible Blu-ray sources like Blu-Ray Disc™, and decrypt any Blu-ray encryptions, such as AACS and BD+ (for legal use only). Step 3 Click on “Open File” or “Open Disc” button to load the Blu-ray, when the loading is finished the screen will go black and then you can get the website URL “http://airx.tv “. Step 4 First you should make sure that your iPad is connected with your computer via WiFi. Open an internet explorer in your iPad and then copy and paste the website URL in Step 3 into it. Then the loaded Blu-ray source will be listed, you can enjoy Blu-ray movies on your iPad. Note: If you want to enjoy Blu-ray on your iPhone, iTouch, you can also refer to the way of playing Blu-ray on iPad. I have purchased several PAL Blu-ray’s and none of them play. Always I get an error message from the Blu-ray player program saying ” failed to play Blu-ray disc”. This has just recently started happening to me. Can you help as the program is useless to me the way it is. @Ray We feel regret to the inconvenience caused to you, please send your screenshots of error to our support team support at macblurayplayer dot com, they will help you promptly. Does the latest version of the software support both NTSC and PAL? There are some movies that are only available in PAL and I’d like to know if this software would support them. Thanks so much for your interest in our software. As to your question, I’d like to tell you that our player support both NTSC and PAL. this program didn’t work on my system. I have the most advance system . @Aly Rashid, Could you please send your detailed info. (computer configuration, and error screenshot) to our . They will give you prompt solution. Did you resolve the issue? I still have the issue (current version is 2.7.0.1402). @Lee Wise, We are dealing with the issue, and it will be resolved soon. If there is any improvement, our support team will contact you at once. “How to Play Blu-ray on iPad directly? – Mac Blu-ray Player Official Blog” was a very great blog, . Continue posting and I am going to continue to keep reading through! Thanks so much foe using our software. But I’m sorry to tell you that we have some bugs on the ios6 at the present time. You can enjoy it on ios5 with no problem. Thanks for your understanding and wish you all the best! 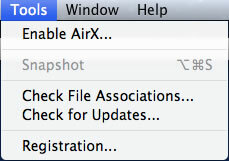 As to your question, I’d like to tell you that our software do support AirX on iOS5 at the present time. And now all our engineers are focus on realizing the Blu-ray menu function and have released the version 2.9.5 Blu-ray menu version. But our tech-department have schedule to fix the problem of AirX function. After fixing the bugs of Blu-ray menu, we will work hard to fix the AirX on iOS6 and iOS7. By the way, we recommend you have a try on this version and any suggestions would be appreciated.